Find out today which debt relief programs you qualify for and how much money you could be saving each month! Good news! We can help you with debt. Thank you we just received your savings estimate request. If you need to get relief from multiple high interest credit cards or other unsecured debts – such as medical bills, store charge cards, gas cards, or more – a debt consolidation program may be able to help you get out of debt much faster. This could, not only help to reduce stress, but also save you a substantial amount of money. Debt consolidation programs, also known as debt management plans (or DMPs), are typically coordinated through a credit or debt counselor who will take the time to go over your current financial situation, look at your unsecured debts, look at how much you can afford to pay each month toward your debts, then submit proposals to creditors on your behalf requesting relief. Overall, the goal of a debt consolidation program is to provide you with a proven and predicable way to combine or "consolidate" all your debts into a single payment each month by providing a personalized plan that, if followed each month, can help you get out of debt at an accelerated rate. If you are faced with credit cards and other debts that have made your bills very difficult to manage on your own, a debt relief program may, not only be able to help you get out of debt – but also lower your payments each month. Depending on your current situation, debt relief may also be able to help reduce your interest rates, remove late fees and penalties, or even settle credit card debts for much less than you owe. With your free debt analysis and savings projection, a debt relief specialist will take the time to go over your current financial situation then customize a debt relief program for you, based on how much you can afford each month. 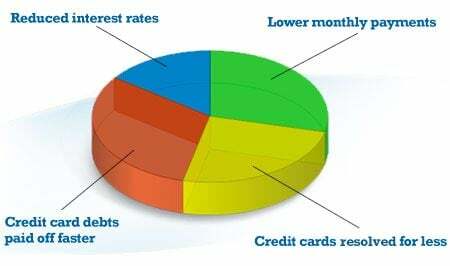 If you have high interest, or high balance credit cards, you may be on a "credit card debt treadmill" that has become very stressful, and more than you can handle on your own. While avoiding non-essential credit card purchases, and paying down your debts each month, can help you get out of debt – a proven debt relief program may be able to help you get out of debt considerably faster. Depending on the debt relief program that best meets your needs, your free debt relief evaluation can provide you with a projection of how much debt relief could save you – as well as the estimated time required to get out of credit card debt. If you have high-interest credit cards and other debts and are need of relief – a debt consolidation program could simply your life, help you save money, and get out of debt faster by reducing your interest rates. Though a free debt relief analysis, a debt specialist will go over your existing debts, current interest, and financial situation – then make proposals to each of your creditors on your behalf, requesting lower interest rates and often more favorable repayment terms. Each creditor who agrees to the proposals are then added to the "debt management plan" – which can not only lower interest rates and remove late fees and penalties – but also help you get on a faster track to get out of debt. Settle Credit Cards for Less? Settle Credit Card Debts for Less? If you have one or more high-balance credit card debts and need to "settle" your debt for less than you owe – a credit card debt settlement program could save a substantial amount of money. When credit card companies decide to sell off their "bad debt" to debt collection agencies, it is not unusual for credit card companies to sell the debt for as little as ten cents on the dollar. This is not to say that credit card companies will agree to "settle" credit card debt for as little as ten percent of the amount owed, but it stands to reason that credit card companies are often willing to accept a reasonable offer from consumers in distress who offer to pay what they can afford. A personalized debt relief analysis can provide a savings estimate for credit card settlement. How much debt settlement could save depends largely on the amount of credit card debt involved, the debtor's current financial situation – and the settlement policies of individual creditors. Many California residents struggling with credit cards and other unsecured debts are looking for a debt relief option that will provide much-needed relief, and possibly save them a substantial amount of money each month. In seeking relief from a debt consolidation program, consumers will combine or "consolidate" all of their high-interest unsecured debts into a single, less stressful payment each month made to a debt consolidation company. The debt consolidation, or credit counseling company then distributes payments on time to each of your creditors until all debts in the program are paid off, or resolved. However, before going further into the details of a debt consolidation program, it's important to understand how a credit card debt consolidation program differs from a debt consolidation loan. While the goals of both debt consolidation debt relief and a standard debt consolidation loan are very similar, the method of getting relief is quite different. In the case of a debt consolidation or debt management plan coordinated by a credit or debt counselor, the goal is to gain an understanding of the debt load a consumer is facing, the amount of money each month that can reasonably be allocated to payoff or pay down debts, then design a personalized plan that "consolidates" multiple high-interest consumer debts into a more affordable and more structured payment plan each month. These plans allow consumers to resolve debts as quickly as possible, at a pace they can afford. If you are in need of debt relief assistance: Get a free debt relief analysis and savings estimate from a BBB accredited provider at no obligation. In comparison, a debt consolidation loan involves taking multiple high-interest credit cards and other debts and paying them off all at once with the proceeds from a debt consolidation loan. In theory, it seems as though a debt consolidation loan can "convert" multiple high-interest debts into a single, lower interest rate loan. However, California residents should be aware that they typically require collateral, such as a home or other asset, for loan approval. That means consumers, already struggling with debts, will be putting their home or other large asset at risk if future financial hardships were to arise. Essentially, they may have traded "unsecured" debt that doesn't put their home at risk into a "secured" debt that puts their home at risk. In addition, many consumers who pay off credit cards with a debt consolidation loan actually end up accumulating additional credit card debts quickly. In this scenario, the cycle of debt continues as consumers now have BOTH a debt consolidation loan and multiple high-interest credit cards to deal with. Thus, the situation has gone from bad to worse. Debt consolidation, also known as a debt management program (DMP), combines or consolidates multiple high-interest consumer debts into a single, more manageable and more structured monthly payment. Through the benefits of debt relief such as lower, more lenient, interest rates and the waiving of late fees and penalties, a debt management plan coordinated by a credit counselor or debt counselor can be provide personalized assistance for consumers who need a proven, predictable, and accelerated path out of debt. In order to customize the plan for the consumer, a credit counselor (or debt counselor) typically will interview consumers to gain a clear understanding of all of their debts. Then they will conduct a budget analysis with consumers to find out how much money can be realistically allocated each month to pay down those debts. Based on the information they've gathered, they will come up with a game plan (a debt management plan or DMP) and send proposals to each of the consumer's creditors requesting the benefits of debt relief for the individual or family experiencing financial hardship. These benefits can include lower interest rates, a waiving of late fees and penalties, and generally more favorable repayment terms. Those creditors who agree to the proposals are then added to the debt management plan. For those that do not, consumers are still obligated with creditors according to the terms of their original agreements. Overall, it's important to remember that debt consolidation or debt management plans can be very effective and save a substantial amount of money IF consumers STOP using credit cards and begin the process of paying down the principal amount of debt on time, month after month, at a LOWER INTEREST RATE. 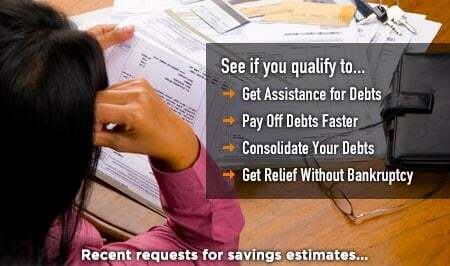 Find out if a debt consolidation or debt management plan could help you resolve debts faster and have you saving, by requesting Your Free Debt Relief Evaluation and Savings Estimate. Although the state government of California does not provide debt grants or programs to help consumers resolve their debts, it does provide a variety of programs for individuals and families who are low-income or need a helping hand while experiencing difficult circumstances. These programs are specifically designed to provide more immediate financial assistance and relief, and helps individuals and families with children get access to food, healthcare, and other basic necessities. California also has agencies that can assist with housing concerns and help consumers avoid foreclosure. To learn more about these services, go to the state's homepage and click on the Benefits page. It's important to know that debt consolidation requires discipline and typically three to five years to complete the program and take advantage of all the money saving benefits. On the other hand, a popular alternative to debt management is debt settlement, considered a more aggressive form of debt relief. Debt settlement may help consumers, facing the prospects of bankruptcy, get out of credit card debt faster, assuming they can accumulate money in a "set aside" designated account which can later be used as the funding source to reach a settlement with individual creditors. It's customary in debt settlement, that if consumers fall seriously behind in payments, credit card companies can decide to eventually "sell off" debt as "bad debt" to a collection agency. In this scenario, creditors may get as little as 10 cents on the dollar, so it stands to reason that credit card companies may be willing to accept a reasonable settlement offer made by the consumer or by a debt settlement company working on the consumer's behalf to negotiate a settlement. Be aware that when consumers default on the terms of credit card agreements in order to set aside monies in a settlement account, creditors may threaten or take legal action. In addition, money saved through credit card negotiated settlements are subject to federal taxation. Finally, debt settlement typically will have a negative impact on one's personal credit, but not as serious or long lasting of an impact as personal bankruptcy. Request Your Free Debt Relief Evaluation and Savings Estimate to learn more about your debt relief options. It only takes minutes - start now. Saving thousands of dollars feels really good! Know your debt relief options. People helping people get the debt relief they need. When you work hard to provide a bright future for your children, you don't want high interest credit card debts to get in the way. You need a proven path to become debt free as quickly as possible. Copyright © 2019 DebtReliefCenter.org, All Rights Reserved.